March 18, 2019 (Source) — TerraX Minerals Inc. (TSXV: TXR) (FSE: TX0) (OTC Pink: TRXXF) TerraX minerals has completed relogging and sampling of 1579 meters of the 16,000 meters of historical drill core recovered from the Giant Mine core yard (news release January 14, 2019). 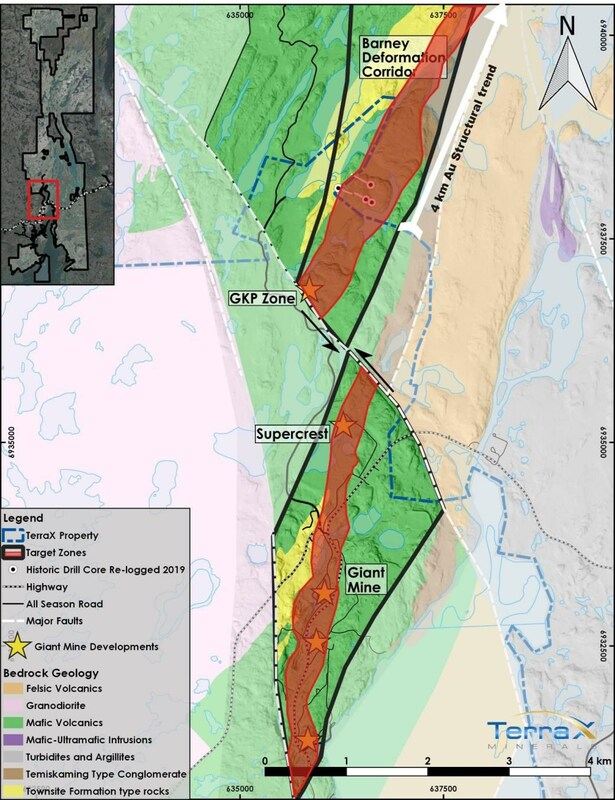 TerraX is highly encouraged that gold mineralization trends onto the Barney Deformation Corridor (“BDC”) target zone along the northern extension of the structure that hosted the Giant Mine (Figure 1). 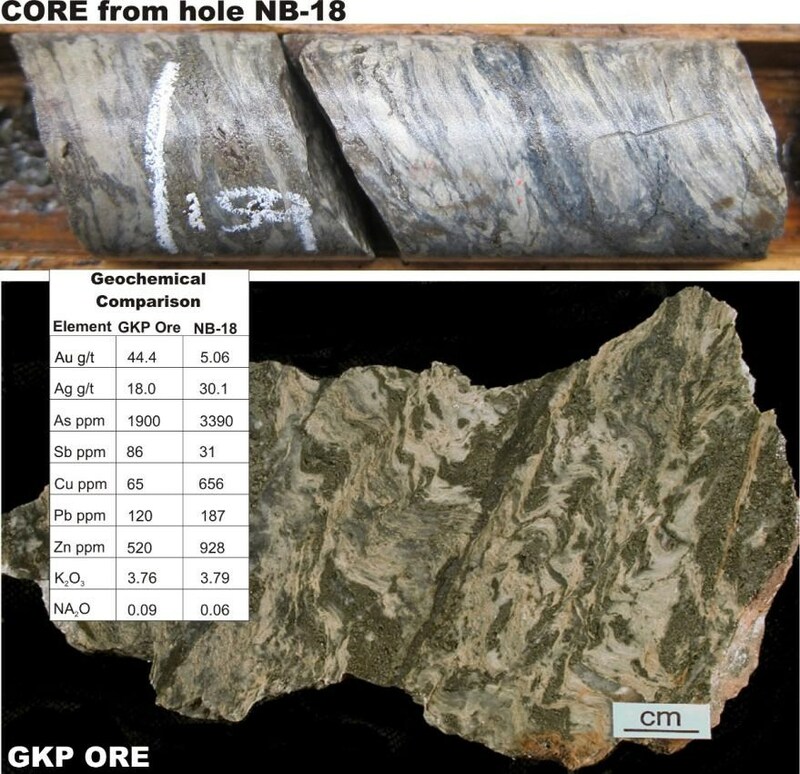 Mineralization within the historical drill core is adjacent to historical high-grade assays within vein and shear zone structures across broad zones of alteration similar to Giant. Individual assay values from the margins of the historical sampling included 5.06 g/t Au, 2.74 g/t Au, 1.65 g/t Au, 0.99 g/t Au, and 0.96 g/t Au. For the 5 holes reported today, TerraX collected 411 samples for assay. Results ranged from below detection to 5.06 g/t Au. TerraX inserts certified standards and blanks into the sample stream as a check on laboratory QC. Drill core samples are cut by diamond saw at TerraX’s core facilities in Yellowknife. A halved core sample is left in the core box, unless core was previously sampled, and in these cases a quarter core sample was retained. The other half or quarter core is sampled and transported by TerraX personnel in securely sealed bags to ALS Chemex’s (ALS) preparation laboratory in Yellowknife. After sample preparation, samples are shipped to ALS’s Vancouver facility for gold and ICP analysis. Gold assays of >3 g/t are re-assayed on a 30 gm split by fire assay with a gravimetric finish. ALS is a certified and accredited laboratory service. ALS routinely inserts certified gold standards, blanks and pulp duplicates, and results of all QC samples are reported. The Yellowknife City Gold (“YCG”) project encompasses 783 sq km of contiguous land immediately north, south and east of the City of Yellowknife in the Northwest Territories. Through a series of acquisitions, TerraX controls one of the six major high-grade gold camps in Canada. Being within 10 km of the City of Yellowknife, the YCG is close to vital infrastructure, including all-season roads, air transportation, service providers, hydro-electric power and skilled tradespeople.